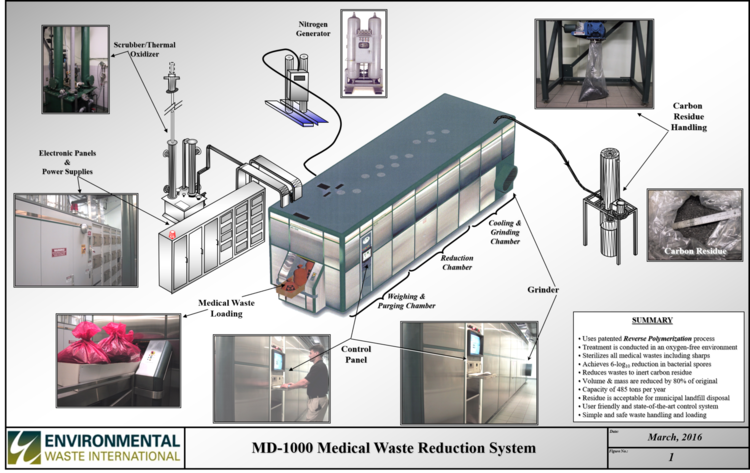 The EWS Model MD-1000 is designed to process 2,700lbs (1,225 kg) of medical and biomedical waste daily. It can be located within a hospital or in a central location between hospitals. It can process packaging, plastics, anatomical wastes, glass and sharp tools/objects. Medical waste, usually placed directly into plastic bags within the hospital, is loaded into a tray that is placed in the weighing and purging chamber of the MD-1000. Here the mass is recorded and the air is replaced with nitrogen. No preprocessing, such as grinding of untreated waste or sharps, is required, thereby minimizing worker handling and the risk of exposure to pathogens. The waste then moves into the reduction chamber where the Reverse Polymerization (RP) process is applied. Following the reduction cycle, the waste is cooled and ground to allow for easy disposal. The waste mass and volume is reduced by up to 80% and exits the system as a landfill ready, sterilized carbon residue. The complete cycle-time is 50-80 minutes per load. This system reduces the need for special onsite storage, special transportation or special off-site disposal. The MD-1000 achieves greater than 6log10 reductions of all tested pathogens, including Bacillus Stearothermophilus. The Environmental Control System treats the gases produced to ensure safe and acceptable levels of all effluents. EWI’s RP processing of medical and biomedical waste should not be confused with microwave disinfection or microwave autoclaving processes. These systems use microwaves to generate steam to inactivate pathogens to a 4log10 level, which only sterilizes the surface of the waste (disinfection). The RP process should also not be confused with pyrolysis or plasma systems which lack the ability to control the process and require much higher levels of heat or energy to break the waste down. The Microwave Delivery System that generates and transmits direct microwave energy to the waste load. The Material Handling System that allows for efficient processing of waste on a continuous batch basis. This includes the loading chamber, the RP processing portion and a cooling & grinding chamber, as well as a residue handling system. A Nitrogen Generation System that provides a constant supply of nitrogen to maintain the safe operating parameters of the RP process and to prevent oxidation of the waste during the treatment cycle.